I've been a stay at home mom (SAHM) since I got married in 2000. I started being a work at home mom (WAHM) since 2010. At first, I only wanted to spend some of my free time to earn a little money by finding some writing gig online. I never really imagined that I would be doing it more and more. It is such a blessing to my family especially when my husband lost his job 6 years ago. What I earn as a WAHM help sustain our family's financial needs. Many mothers today dream of having a job that would allow them to spend time at home with their family and earn money at the same time. Most regular jobs do not allow that. However, becoming a WAHM may well be the key to reaching this yearning. If you want to take this path of working at home, here are some valuable tips that could help you be a WAHM. 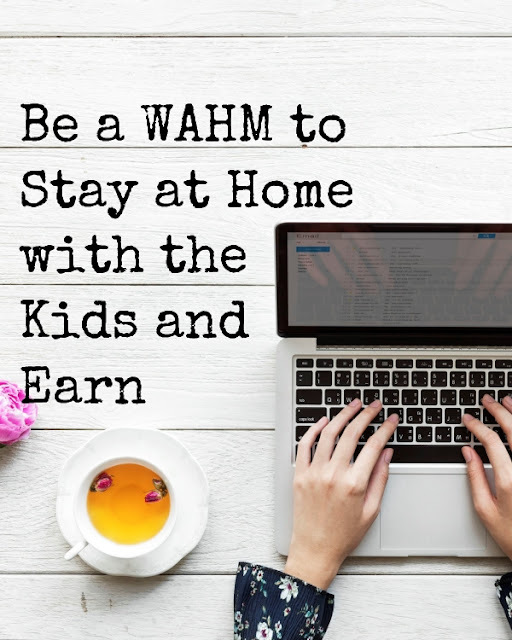 WAHM is a very straightforward acronym which means Work At Home Mom. In the last 20 years, a growing number of women have left their careers and went back home. It's not easy to make such a decision. Especially with families that need both husband and wife to work together and make both ends meet. But being women with a career in the corporate world or somewhere else is not easy. After working long hours at work, when they get home they still need to do the housework and take care of the kids. It's usually a very tiring day for the busy full-time working mom. Sadly, the kids are often left with little quality time with mom who is very worn out already. But WAHMs have a different experience. WAHMs are showing everyday that they can make a contribution to the family's finances and take care of their families as well. Online and offline, women have found ways to help in meeting the financial needs of the family. How do you get started as a WAHM? First, you have to speak to your family regarding your plan to be a WAHM. I remember I asked my husband if it was ok for me to accept an online job. He said it was ok.
Next, you need some ideas on getting started with working at home. It's a good idea to explore the opportunity of connecting with other WAHMs. Just search for WAHM groups on Facebook or Google+. I also read a lot online to find out how I can start. I learned about oDesk and Freelancer. That's where I found my first clients even up to the present (for Upwork formerly oDesk). If your earnings when you had a career contribute a big part to the family finances every month, then shifting to working at home will significantly affect your finances. Make sure that your family has enough financial cushion to provide for the first 6 months of your new occupation. It is going to take some time before you can be established as a WAHM. First, determine your passions and skills. WAHMs could find opportunities to work for a person doing things like audio transcription, writing articles and bookkeeping. Bear in mind that there are also scam work opportunities. Legitimate businesses in search of professionals will not ask for money in advance from you. Some WAHMs create their own niche and start an online business. If you have skills in making crafts, you could create a website to market your crafts and sell what you make. Blogging is likewise another option. Make a blog regarding your interest or specialization and build a following. To generate revenue, you can do affiliate marketing or search engine marketing. With a new career as a WAHM comes the issue of balancing work and home. Just because you are staying at home doesn’t mean that you can do everything around the house and take care of the kids. Establish a schedule for work and home every week. Setting boundaries when you will work and when you are supposed to be with family is important. If you're not careful, you might end up with the same situation as when you were working for a company. It's all right to ask help from family members so that house chores will get done. It also develops responsibility and diligence among the family. Prepping meals is a great way to make cooking for the family easier. Scheduling what needs to be done like laundry and other stuff is very helpful. While I did not consider this option when raising our children, you may find this option very practical and helpful. A babysitter can let you have a break from taking care of the kids. But what I do is just ask the older brothers or sisters to take care of the younger. If you have a designated place for work, it somehow sets up a boundary when you should be working and when you should not work. It also helps your children realize that you're concentrating on doing your work at home jobs. As you can see, there are advantages to being a WAHM. But you have to plan it carefully so that everything is balanced. Be patient in looking for work. Don't forget your family because their support makes all the difference. Do you want to work from home? Why or why not? I have a free resource for you. Download this ebook to know more about how you can start working from home. Thanks for sharing all these valuable tips! While working from home you are your own boss. You don't have to work under a boss and follow his orders and that's the best advantage ever, as for me :) Moreover, you can work whenever you want! You can take rest from work when you want to! I admire and support all WAHM's. It isn't easy, and it requires more discipline than people think. You have a great blog here, and I would like to have you do a guest blog on my site. I get about 300 readers a day! You provide valuable information and this info helps others. Cudo's! !